A Chapter 7 bankruptcy works by liquidating all of the filer's assets which are considered non exempt. The money from the assets is then distributed to creditors. Certain remaining debts may be discharged. 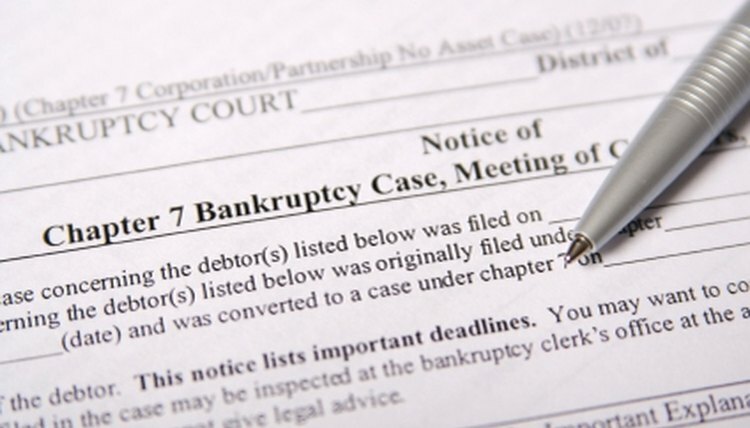 For some people, filing a Chapter 7 bankruptcy allows them a new financial start. One of the most important things to do after a Chapter 7 bankruptcy is to obtain and rebuild credit to improve a credit score. Higher credit scores make it easier to obtain home and car loans. Although it may not always be easy, it is possible to obtain credit after a Chapter 7 bankruptcy. Get a secured credit card. These cards work by putting a specific amount of money into the credit card account upfront. It is a type of collateral. Money is deducted from this upfront amount if you fail to pay your bill. This type of credit card is easy to obtain since there is no risk to the creditor. Apply for a credit card with a low limit. Several credit card companies may give people who have filed a Chapter 7 bankruptcy a card with a very low limit such as 200 or 300 dollars. This is different than a secured card because no money is deposited into the account as security. This limit may be periodically raised if you always pay your bill on time and stay under your limit. Improve your credit score. This will show creditors you are responsible and make obtaining credit easier. Keep balances low. Usually staying under 50 percent of your credit limit is recommended. It's essential to always be on time with payments. Write to credit bureaus. There are three main credits bureaus that assign you a credit score, including Equifax, TransUnion and Experian. Not all credit cards report to all agencies. If you are paying bills on time and staying well under your limit, write to the agency, which may not be receiving a report from the credit card company. This may help improve your credit score and help you obtain additional credit. Try for a small loan. If you belong to a credit union, they may be willing to give you a small personal loan. Credit unions are sometimes easier to obtain credit from than a large bank or credit card company. DePietro, Maryann. "How to Obtain Credit After Chapter 7 Bankruptcy." , https://legalbeagle.com/4578284-obtain-credit-after-chapter-bankruptcy.html. Accessed 19 April 2019.